SOUTHAMPTON, PA, USA, July 17, 2014 – Environmental Tectonics Corporation (OTC Pink: ETCC) (“ETC” or the “Company”) announced today the shipment of the third and fourth chambers, completing the requirement of four Research Altitude Chambers to the 711th Performance Wing at Wright Patterson Air Force Base in Dayton, OH, USA. The third and fourth altitude chambers, which are part of a total suite of four chambers sold to the U.S. Air Force, were shipped on June 24, 2014 and July 2, 2014, respectively. 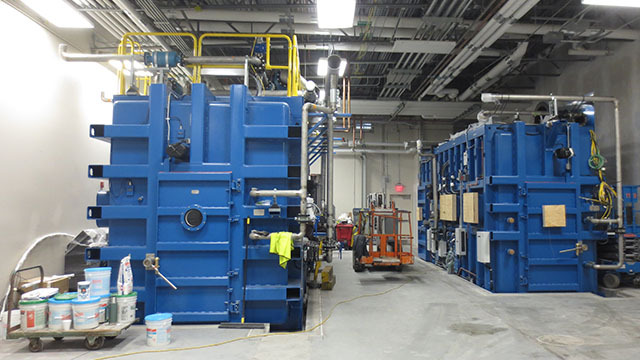 The chambers are currently undergoing installation, and will be integrated with the facility, as well as the other two chambers that are currently onsite. Valued at over $37 million, the suite of research chambers allows maximum flexibility for the design and configuration of unique test scenarios under a wide range of environmental conditions. Each of the four chambers will have its own unique internal layouts and compartmentalization. Three of these four chambers will be “man-rated” allowing human occupancy for ongoing initiatives. The fourth chamber will be utilized for equipment and various research testing scenarios.